8 a.m. – Flea market at Porte de Vanves (avenue Marc Sangnier and avenue Georges Lafenestre, 14th arrondissement) At this early time, the sun starts rising while the exhibitors keep on installing their stands. You can feel that here, everybody knows each other, which creates a pleasant and informal atmosphere. We start walking around the alleys, on the lookout for the love-at-first-sight article we could buy. The concept of a flea market is to go there without looking for anything in particular, and if your intention is to look for one special article, then you can never be sure to find it. Therefore you can either leave the market loaded with stuff but an empty bank account, or the wallet full of money, but disappointed by not finding the real gem. Less known and much smaller than the flea market at Porte de Clignancourt, you can nevertheless find everything, and sometimes also anything. You can see merchants who seem to have emptied their cellar on that same day with the most useless stuff. You can therefore find all sorts of articles for very cheap (1/5€). On the other side, superb furniture, ancient crockery, pieces for collectors are exposed, with much higher prices (300/400€), but which are still very interesting tariffs given the originality of the articles. 9.30 a.m. – Market for ancient and second-hand books (104, rue Brancion, Parc Georges Brassens, 15th arrondissement) A few minutes away from the flea market of Porte de Vanves, we enter a quite different universe. The market for ancient and second-hand books attracts, beneath the halls of the Georges Brassens park, a more enlightened, even passionate public. The setting is much more intimate and gives you the opportunity to go deeply through the different stands, surrounded by a smell of ancient paper. You will find second-hand books in paperback for a very reasonable price as well as collector’s examples with naturally higher prices. Please note that all kinds of books are being sold, and that you can find, other than novels, also cooking books, comics, dictionaries and foreign language manuals. And the collectors will be pleased by the large choice they will find at this market. Passing by a stand, I almost fell for a book with ancient bindings, written in the 19th century and dealing in scientific terms with the cultural specificities of colonized populations in Indochina. 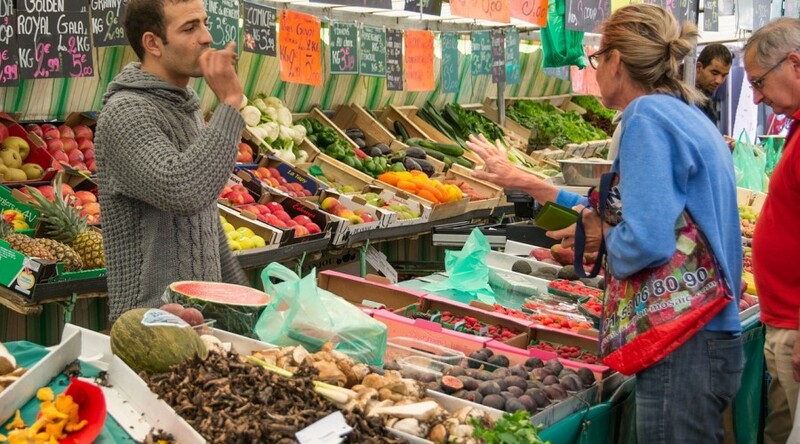 It’s time to continue our market tour, towards the underground and the 13th arrondissement. 10.30 a.m. – Alésia market (rue de la Glacière, 13th arrondissement) As soon as you get there, you will feel you’re in a small neighbourhood market. Here, neither old furniture nor books for collectors, just food. And even if it’s not lunchtime yet, the smells and the vision of all the products will certainly whet your appetite. The Alésia market extends on a single road over a few hundred meters, but is a good ambassador of the gastronomic prosperity of our country and its diversity. The vegetables are side by side with the cheese stand, which is next to the fishmonger and the rotisserie. You can easily see that the clients are regulars living in the neighbourhood. Merchants and customers know each other and inquire after family and health. The shopping trolley, essential companion, is a speechless witness of these collective scenes. Even if the 13th arrondissement isn’t quite the most beautiful one of Paris, we chose it to appreciate the local community life, which is without a doubt very intense. 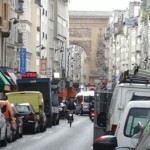 Let’s now head towards the more popular Charonne area, in the 11th arrondissement, for another food market. 11.30 a.m. – Charonne market (Boulevard de Charonne, cross-road with rue Alexandre Dumas, 11th arrondissement) The calm atmosphere from the Alesia market is now over. 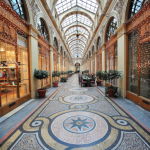 As soon as you get to the unique alley all along boulevard de Charonne, you can’t hear anything else anymore than the merchants calling out for the clients. In this market, you will find not only food. There are clothes, kitchen items and even beauty products (shampoo, soap, etc.). The population reflects also better Paris’ cultural diversity. All origins come together in this weekly meeting, and we’re rapidly charmed by this cultural richness. Past the folkloric character, we notice that the indicated prices are cheap, even cheaper than on other markets, and also more attractive than in traditional shops. 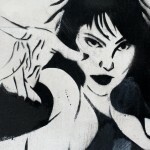 If some panels attract the clients attention though (everything for 1€), the quality may not be the best. The advantage of a market is that you can ask the merchant where the goods are from, even taste it, and the more intimate relations are much nicer than the austere setting of a supermarket. It is past noon, all the food we’ve seen whetted our appetites. Let’s head toward the very bobo 3rd arrondissement. 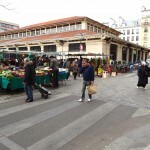 12.30 p.m. – Market of the “Red Children” (39, rue de Bretagne, 3rd arrondissement) This market is the oldest one in Paris. It has been rehabilitated in the first decade of this century to become this place of conviviality it is today. Once again, the atmosphere changes. The cultural diversity has given way to a more casual chic style, typical for the population of this neighbourhood. The 3rd arrondissement is bourgeois, everybody knows that, but don’t say it too loud, it is not very trendy. The Market of the Red Children is the ideal place for having lunch in a convivial atmosphere. We are starving, so we don’t want to lose any time going around the place. Let’s keep the walking for after lunch. Situated mostly under the roof of a warehouse, the market isn’t very big (around 2000 m²) and proposes of course fruit and vegetables, fish etc. … But the principal interest of this market is all the small restaurants, which give you the opportunity to eat inside the market for a quite reasonable price. First, you chose the one you like most (Japanese, Lebanese, Italian, Creole …) or if you prefer the one where less people are queuing up so to be served rapidly, then you order. When your order arrives, you can sit down at any big table. Next, direction boulevard de la Chapelle, in the Barbès neighbourhood. 2 p.m. – Barbès market (Boulevard de la Chapelle, near the Lariboisière hospital, 18th arrondissement) Barbès is the exuberance of Paris, it is the meeting point of all populations, of all origins. It is the clogged lung, but not yet sick, of the smoking, partying and popular Paris. Beneath the line 2 of the elevated railroad, we enter the market, in-phase with the image of the neighbourhood. There are people shouting, pushing, in this unique alley that seems to be narrow on purpose, so that the people heat up mutually. This may be a good idea in winter, but today the sun is shining bright and it is hot, very hot. This market looks a bit like the Charonne market, and the prices seem to be unbeatable. But what about the quality? We start a bargain with the merchant… Everybody digs, tries to elbow his way through. The queue is here a vast concept that needs to be revisited. The market is now over soon, the fishmongers are slowly shutting down their stand, and all try to get rid of their stock. It’s the right time for good deals on every market in Paris. You can see on each side of the boulevard bargain-hunters who are getting ready to pick up the food that has been left behind. See you next Saturday? Je suis un habitué du Marché Alésia. Les produits y sont de qualité. Vraiment sympa cet article. Est-ce que vous avez un fil RSS ? J’aimerais vous suivre pour ne pas rater les prochains articles. The most picturesque and cheapest market of Paris, existing from 1779.